Beautiful acacia with slightly weeping habit, grey-green leaves (phyllodes) with pink-red new tips and profuse pale yellow flowers in winter. 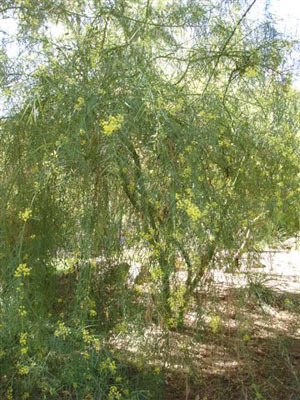 Dense spreading medium shrub 9-15'. Tolerant of extended dry periods, moderate frosts and saline soils. Ornamental screen or low windbreak.